Douglas was twice a Division 1 NAIA All-American during a college career in which he accumulated 42 sacks in 32 games. 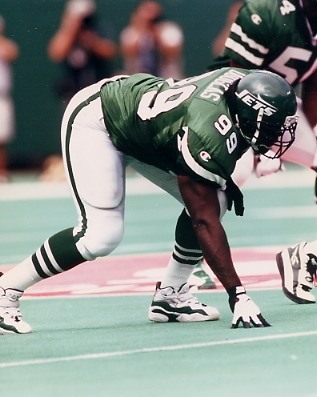 He was chosen by the Jets in the first round (16th overall) of the 1995 NFL draft and, used initially as a situational player for his pass rushing skill, moved into the starting lineup in November. While he was on the light side for his position, but compensated with good speed and agility (he eventually filled out to 280 pounds). Jets went 3-13 to finish fifth in the AFC East while leading the league in fewest passing yards allowed (2740) – although they ranked 25th against the run (2016 yards). Ankle problems limited Douglas to 10 games in 1996, but he still accounted for 8 sacks and improved as a defender against the run. However, with the arrival of Bill Parcells as head coach in ’97 the Jets shifted to a 3-4 defense and Douglas proved to be a poor fit. He was traded to the Philadelphia Eagles in 1998 and, back in a 4-3 alignment, flourished as he registered 12.5 sacks. Knee and biceps injuries limited him to four games in ’99 but he came back in 2000 to post a career-high 15 sacks and achieve consensus first-team All-NFL as well as Pro Bowl honors. Two more Pro Bowl seasons followed in 2001 and ’02 in which he had 9.5 and 12.5 sacks, respectively. Douglas went to Jacksonville as a free agent in 2003, had a disappointing season as accumulated wear began to show, and finished up his career in ’04 back with the Eagles. Overall, he had 80 sacks over the course of ten seasons and 138 games, was chosen to the Pro Bowl a total of three times, and received first- or second-team All-NFL recognition on two occasions.